Formerly aka Tipprut, Tubrid is said to derive its name from Tobraid Chiaráin, the Holy Well at which Saint Declan supposedly baptised a local infant named Ciaran Mac Eochaidh, who later accompanied Saint Tighearnach of Clones to Tours and became a saint himself, founding a monastery locally and working “many miracles and holy signs” (he is commemorated by the church at Ballylooby). The well was long a place of pilgrimage and, until recently, the venue for an annual Mass. Tubrid village has long been abandoned, but still contains several remains of historical / architectural significance. St John’s church (CoI), once an impressive edifice, but now roofless, was built in 1820 and was abandoned 99 years later, during the Civil War. (See photo) It is surrounded by gravestones dating back to 1680, several of exceptional beauty. Nearby, the former schoolhouse, roughly the same age as the church, is in semi-ruinous condition. A Memorial commissioned by both denominations recalls Dr Valentine Flood, who died of Typhus in 1847 during the Great Famine while working in the local dispensary hospital, aka “the fever sheds”. The Mortuary Chapel, also roofless, is the burial place of several notable Counter-Reformation luminaries, notably the great Gaelic poet / scholar Seathrún Céitinn / Geoffrey Keating DD (b. 1570, the French-educated author of the posthumously published Foras Feasa ar Éirin (1634), the first history of Ireland from prehistoric to Norman times. A plaque dated 1644 in the gable asks for prayers for Céitinn and the poet Fr Eugenius Duhy / Eugene Duffy, who built the chapel. An 1843 sketch of the site, together with a jaundiced appreciation of the historian, can be found here. (Geoffrey Keating is also commemorated by monument erected by the local community in 1990 beside the bridge in the adjacent community of Burgess West, formerly believed to be his birthplace. Modern scholars favour nearby Moorstown Castle as more likely). Tubbrid is within east reach of Ardfinnan on ByRoute 3. The church of St John the Baptist (RC) at Duhill, built in 1830, is a charming edifice with fine stained glass windows by Harry Clark, notably one depicting Salomé presenting the Saint’s severed head to king Herod. St Kieran’s church (RC) was erected in 1813 and later enlarged, but a boundary dispute led the neighbouring landlord to erect a wall within the church and issue writs for trespass against anyone who crossed it until the disagreement was eventually settled. Virtually rebuilt in 1929, St Kieran’s still features pews and stained glass windows bearing the names of local families that sponsored them. The former RIC barracks, sold to a local schoolteacher in 1919, became the focus of international attention in December 1920 when two ex-constables who had been stationed there gave evidence to the American Commission on Conditions in Ireland of the brutality and lawlessness of the Black & Tans. The Parish Hall, accessed by an odd little bridge, once housed two schools, for boys and girls respectively. A Memorial in the centre of the village commemorates Ned Tobin, who achieved national fame as a track and field athlete, particularly in throwing the 56 pound weight “without follow”. The Village Inn, adjacent to the church, is a friendly pub with a beer garden, and serves good food. Ballylooby is close to Clogheen on ByRoute 3. Burncourt is a small village that, like the Burncourt River, takes its name from the famous nearby castle. The area was granted by King Charles I to Sir Richard Everard in 1640. Burncourt Castle / The Burnt Court / Clogheen Castle / House is arguably the best example of a Tudor style fortified house in Ireland. Construction of the many-gabled mansion commenced in 1641, at the start of the Wars of the Three Kingdoms. Sir Richard Everard became a leading member of the Kilkenny Confederacy, and was hanged by General Ireton in 1651. Oliver Cromwell mentioned visiting it in 1649, although according to tradition it was burned down by the chatelaine, Lady Everard, to prevent its use by approaching Parliamentarian troops. Whoever set the fire, the house was left an empty shell. C18th engravings show the ruins much as they are now, except that the chimneystacks were still standing. The artist was Anthony Chearnley, who built a house in the bawn and laid out formal gardens nearby. Glengarra Wood, on the southern slopes of the Galty Mountains, was part of the Shanbally Castle estate, which belonged until 1940 to the O’Callaghan family, who held the titles of Baron and Viscount Lismore, and whose former hunting lodge has been converted into a Youth Hostel. The wood contains a number of fine exotic specimens, including the giant Californian Redwood, plus many native tree species, interspersed with open areas of flowering woodland plants. Rhododendrons make a fine display in the early summer. Providing a variety of wildlife habitats, the wood is home to pheasant, jay, kestrel, sparrow hawk, nesting ravens, heron, dipper, grey wagtail and a host of songbirds, together with fallow deer, badger, fox, hare, stoat, red squirrel, wild mink, otter and pine marten. The numerous ponds and wet areas are home to frogs and newts, while the open areas abound with butterflies and other interesting insects and invertebrates. Visitors’ facilities include car parking, log bridges, picnic tables, and information boards. The Kilcoran Lodge Hotel is an attractive old-fashioned hotel, popular as a wedding venue for its beautifully landscaped grounds, with a number of self-catering lodges. Mitchelstown Caves, located 12km east of Mitchelstown (Co. Cork), are (just) in Co. Tipperary. The Old Caves, which are very difficult of access, involving descent by rope ladder, were used as a hiding place by the doomed last Earl of Desmond, outlawed and on the run after the failure of the abortive Second Desmond Rebellion. The New Caves, discovered in 1833 when a farm labourer dropped his crowbar into a crevasse while quarrying limestone, are an unusually extensive cave network of great beauty and scientific interest. Stalactites, stalagmites, calcite columns and flowstones combine to make up surprising formations, many with colourful names. There are 350-million-year-old fossils as well as some more recent cave fauna; the rare Porrhomma Myops spider is an interesting inhabitant. Guided tours take visitors for approximately 3km through the caverns. Skeheenarinky National School, constructed in 1858, is believed to be the oldest NS building still used for its original purpose in Ireland. Ballyporeen (Beál Átha Poirín – “Ford mouth of the little hole”) (pop. 300) is a village on the River Duag. The church of the Assumption (RC) was erected in 1828. Ballyporeen was briefly in the limelight in 1984, when US President Ronald Reagan visited on the pretext that his grandfather, Michael Regan was baptized in the town in 1828 and lived locally until he emigrated to America in the 1860s. The President delivered a speech about his ancestry and the “Irish-American tradition“, and sipped a pint of Guinness in The Ronald Reagan pub, now closed, as is the Ronald Reagan Visitor Centre, due to lack of visitors. The Reagan visit to Ireland was accompanied by protests against US foreign policy, particularly Reagan’s backing of the Contras in Nicaragua. Singer Christy Moore memorably rallied protesters with the song Hey Ronnie Reagan, but peaceful demonstrations in Dublin and elsewhere were savagely repressed by Gardai. Ballyporeen shares a strong GAA sporting tradition with the neighbouring community of Skeheenarinky. Ballyporeen is not far from Clogheen & Shanrahan on ByRoute 3. Galty Castle Woods, straddling the border between counties Cork and Limerick, is a mixed conifer and broadleaf plantation on the Funshion, Glounreagh and Attychraan Rivers, with spectacular views into the Galtee Mountains. A network of looped walks allows visitors to meander through pleasant glades filled with birdsong and the sound of myriad waterfalls. 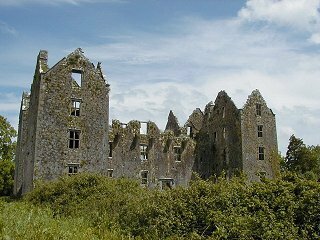 Galty Castle was a late C18th hunting lodge built for the 2nd Earl of Kingston, demolished in 1940; the stones were used to build the Roman Catholic Church in Glanworth. All that remains are the red sandstone stable, the remnants of a water mill that generated electricity for the castle, and an outline of the tennis courts. Kilbehenny / Kilbeheny, a mildly picturesque village almost straddling the meeting point of the borders of Counties Limerick, Tipperary and Cork, is named for its location on the Behena stream, a minor tributary of the River Funcheon. The Old Graveyard surrounds the ruin of a pre-reformation Franciscan church, long under the control of the Franciscan Abbey in Adare, Co. Limerick. Many of the graves date back over 300 years. Amongst those interred here is John Mandeville (1849-1888), leader of the Land League in Mitchelstown. St Joseph’s church (RC), standing in pleasantly landscaped grounds, was built in 1873 to replace a church dating from the 1820s, used as the local school until 1941 and then as a hall until demolished in 1974. It in turn gad replaced a Mass House known to gave been located in Knockrour in 1731. A Monument to Trooper Pat Mullins, a Kilbehenny Soldier Lost in Action on 15th September 1961, was unveiled 50 years after his death, on 15th September 2011. Trooper Mullins, then aged 18 and his friend and comrade, Corporal Michael Nolan from Fermoy, were both killed when their armoured car was ambushed in Katango during the UN Peacekeepers‘ Congo campaign in 1961. Trooper Mullins courageously tried to defend his badly wounded colleague, Corporal Nolan. Sadly his body was never recovered. The Irish Defence Forces and the Irish United Nations Veterans Association commissioned the limestone monument to his memory. One of several “Gateways” to the scenic Galtee Mountains, Kilbennny offers immediate access to great trails for walking, cycling, wildlife observation, plus excellent fishing and climbing opportunities. Kilbehenny is linked by a road through the mountains to Anglesborough on ByRoute 5.